Bengaluru: Mr. Hari Prasad who was diagnosed with Parkinson’s disease, a progressive disorder of the nervous system that affects movement, is embarking on a 40-days road trip with his wife. He will be covering 2,600kms from Bengaluru to Kathmandu to spread awareness on management of Parkinson’s disease to lead a better life. In 2009, almost 10 years ago, Hari Prasad was diagnosed with Parkinson’s disease. He first felt increased tremors in left hand and associated slowness in movements on the left side and that is when he visited Columbia Asia Referral Hospital, Yeshwanthpur for consultation. Since there was a family history of tremors, and the present tremors did not really affect his day to day activities, it was decided that he will be kept under observation over the next few months. The next one year, Hari’s tremors in the left hand increased along with slowness of gait and movement in his left hand. The doctors informed Hari that he was suffering from Parkinson’s disease and was put on medication. Within one year, things worsened for Hari Prasad, his tremors had progressed to the right-sided limbs with further worsening of body movements. He could not work properly or sit for long meetings. It was difficult for him to drive and even for day-to-day activities like shaving or dressing, he required help. As the disease progressed, Hari’s medications were optimized. Meanwhile, Hari had started experiencing fatigue, obsessive symptoms and hallucinations. His left-hand tremors and stiffness had worsened his condition. By 2014, he started experiencing motor fluctuations and had to take break from work. His condition had become very difficult for him to cope with the disease. In January 2015, Hari also complained of sleep issues and loss of concentration. That is when the doctors at Columbia Asia Referral Hospital, Yeshwanthpur suggested Deep Brain Stimulation (DBS) surgery and explained to him about the benefits it will bring in his condition. He underwent bilateral Deep Brain Stimulation in March 2015. DBS is a type of therapy that uses electrical stimulation to treat Parkinson’s disease, essential tremor, multiple sclerosis, and certain other neurological conditions. DBS can be an effective in treating movement problems such as tremors, stiffness, difficulty in walking, and slowed movement. “Post DBS was initiated and a week after Hari Prasad responded well to the surgery. His symptoms of Parkinson’s diseases including tremors, slowness and stiffness stopped and his gait improved significantly,” added Dr. Raghuram G, Senior Consultant- Neurosurgery, Columbia Asia Referral Hospital, Yeshwanthpur. “The Deep Brain Stimulation surgery impacted Hari’s quality of life significantly. After the surgery, he has been able to travel alone within the country and abroad. We have provided him a platform to spread awareness & management on Parkinson’s disease,” said Dr. Guruprasad Hosurkar, Senior Consultant – Neurology, Columbia Asia Referral Hospital, Yeshwanthpur. He is commencing his journey on 18th January. 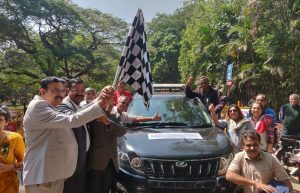 The plan is to reach Kathmandu by 6th February, driving through 11 cities including Belgaum, Kolad, Nasik, Sardar Sarvor, Indore, Bhopal, Sanchi, Jhansi, Agra, Lucknow, Gorakhpur, Lumbini, Pokhara, Kathmandu and back. He will be covering a distance of 2,600kms. Hari Prasad will be addressing seminars on his way to Kathmandu at places like Nasik, Indore, Lucknow, Agra and Pokhara. Post his surgery in 2016-2017 Hari Prasad has taken 2 road trips. The first was from Bengaluru to Bhutan and the second was from Bengaluru to Gujarat and back. It is very important for each one of us, to educate ourselves about the symptoms, treatments and the progression of the disease. For the one’s diagnosed with the disease, meeting doctors and exercising regularly plays a major role in stabilizing Parkinson’s. Da Milano to launch a..
Endress+Hauser India eyes growth in..
Celebrity Vedic Astrologer Mr. Sagar..